Many motorbike owners are still unsure if the new E5 fuel being sold nationwide suits their vehicles, and authorities need to improve public awareness accordingly, officials admit. They say that this task is incumbent upon the Ministry of Trade and Industry, local departments and related agencies. E5 fuel is a mix of A92 petrol (95 percent) and biofuel ethanol (5 percent). Since it went on sale on January 1, replacing RON92 petrol, the biofuel mix has failed to attract expected attention from local drivers, although it is a cheaper alternative. The retail selling price of E5 biofuel is about 2,000 VND (8.9 US cents) per litre cheaper than that of RON92 petrol at 18,243 VND. Meanwhile, the retail selling price of RON95 petrol has been increased by 760-810 VND per litre to more than 20,690 VND. However, since many people are still unsure, they have opted to buy the more expensive A95 petrol. Tran Vu Thien Thanh of HCM City’s District 4 said she was used to buying RON 92. Since it is not available, she was spending more money on A95 because she was not sure if the new E5 biofuel would suit her old motorbike. Le Minh Tuan of HCM City’s Phu Nhuan district said there was little information about E5 and people were still waiting to know which vehicles could use the fuel. Even the staff at petrol stations had little information to convey, expect saying it was more environmentally friendly. The Department of Industry and Trade of HCM City said it has taken steps to encourage people to use E5. Department spokesman Vo Le Bich Dong said they would cooperate with the Ministry of Information and Communications as well as the media to improve awareness of E5. He noted that traders thought that they should be given tax exemptions for selling the fuel. In HCM City, all 534 petrol stations have stopped selling RON 92, replacing it with the E5 fuel. Phan Thi Viet Thu, Vice Chairwoman of the HCM City Consumers Protection Association, said the authorities should provide information to customers on E5 standards, quality and benefits. They should also enhance inspections and monitoring of E5 quality, she said. The trade ministry has asked departments of industry and trade to step up supervision of petrol traders, distributors, wholesalers and petrol stations. Deputy Trade Minister Hoang Quoc Vuong has directed localities and agencies to strictly punish those still selling RON 92. 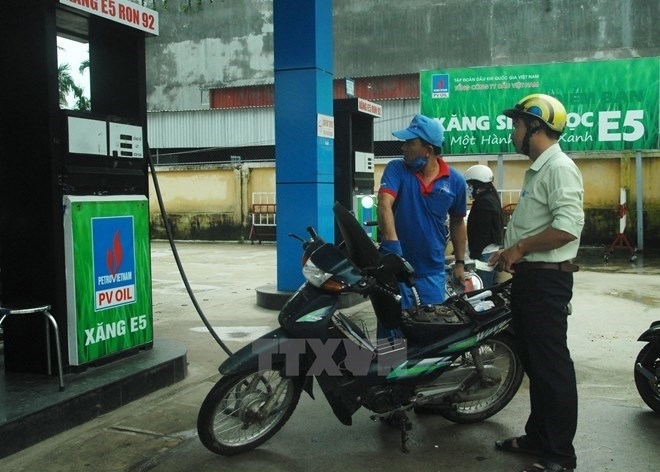 According to PetroVietnam Oil Corporation (PV Oil), the sale of E5 at its stations reached 600-650cu.m per day, accounting for 70 percent of its total petrol sales. PVOil said that all of its stations have replaced RON 92 with E5 bio-fuel since the beginning of the year. The corporation has 11 E5 mixing stations that are operating well and is investing in other such facilities. It has ensured stable supply of E5 to its retail network of 540 petrol fuel stations and more than 3,000 agencies.